This afternoon, around 4:30 PM, the Patriarch of Venice Francesco Moraglia, while he was in the Vatican for commitments related to his office, wanted to make a surprise visit to the construction site of Piazza San Pietro, where the workers are erecting the "Sand pyramid" from which the Sand Nativity will be carved. The Patriarch himself strongly wanted and promoted here in Rome the Sand Nativity. 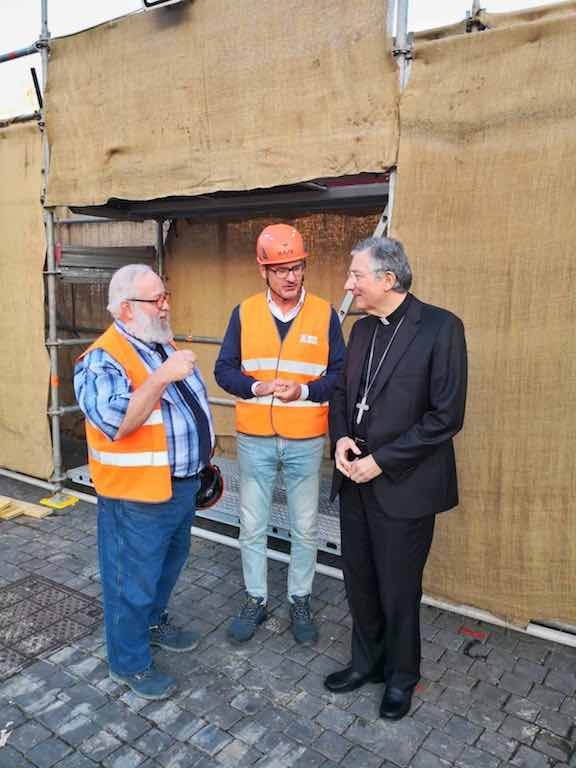 The Patriarch saw the formworks that contain the sand and met the Director of the building site Massimo Ambrosin of the City of Jesolo, and the Artistic Director, the american Richard Varano, who for years has coordinated and advised the numerous artists who build the Sand Nativity of Jesolo.